One of the many perks of working at a library is having first dibs on all of the new books. I pounced on Shane Powers' Bring the Outdoors In as soon as I saw it. The projects are beautiful but not at all intimidating. I especially loved his take on a succulent container garden. 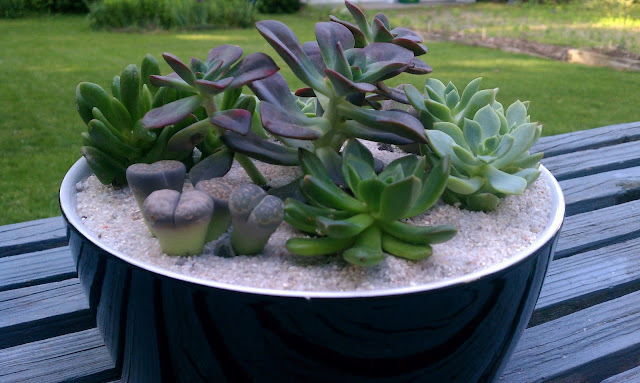 For Christmas last year, I made small tabletop gardens for my extended family members using shallow ceramic bowls; I topped them with polished river stones. The succulent landscape featured in Bring the Outdoors In has a layer of sand atop the soil--I loved the look and decided to try it for myself. Powers suggests using activated horticultural carbon to balance oxygen levels, but . . . I didn't. I put about an inch of stones in the bottom of the dish, positioned my plants, and filled in with potting soil. Once the plants were exactly how i wanted them, I used a funnel to get the beach sand beneath the succulents' leaves and in between all of the plants. There are so many readily-available varieties of succulents, you can really adapt this project to your tastes. I love my new little garden, and I hope make one of your own. Be creative and enjoy!